B & H Engineering, P.C. 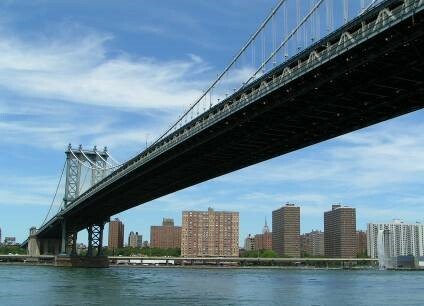 is currently performing the 2018-2019 Biennial Inspection, as a prime consultant, of the Manhattan Bridge and Approaches for the NYSDOT. The biennial inspection included: review of existing BIN folder, inspection and ratings for members and their paint condition, preparation of inspection and project final reports; quality control review on reports and inspection documentation; creation of primary element data base; notification and report preparation of flagged conditions; reporting of flagged conditions, planning and scheduling inspection; inventory verification, coordinating inspection with ongoing construction contract, planning and requesting lane closures; procuring access equipment necessary for inspection; and providing and monitoring work zone traffic control. Condition summary and preventive maintenance observation, inspection findings and photographs, sketches in lieu of plans, database for summary of major deficiencies, primary member ratings, details or situation requiring special attention during inspection, inventory, and flag reports. B & H has also provided biennial inspection services in 2012-2013, 2008 and 2004 as a prime consultant; and 1998 as a joint venture lead consultant, of this structure.